Mitra Sen: "Let us embrace the beauty of every culture and faith to create peace in our world." The Canadian government promotes multiculturalism instead of the melting pot approach of the U.S. But not everyone favors the celebration of cultures and religions which are different from their own. Mitra Sen, a public schoolteacher at Inglewood Heights Junior Public School in Scarborough, ON, experienced this dislike of multiculturalism first hand. "Mitra's first independent production, 'just a little red dot …' inspired by a true story, empowers young people to challenge racism and shares the message of peace and understanding between people of all backgrounds. The film has received 12 international awards including the Most Popular Film at the Chicago International Children's Film Festival, Best Short Film at the Children's Film Festival in India, and the Golden Book Prize at the Roshd Film Festival for Best Educational Film. 'just a little red dot …' has been invited to over 30 film festivals including Roger Ebert's Film Festival and has traveled extensively to universities internationally that deal with Peace Studies." Her concern about her pupils motivated her to create a 48 minute movie: "The Peace Tree" (2005). It portrays the wishes of three girls -- two Muslim and one Christian. The Muslims want to celebrate Christmas -- the day that Christians associate with the birth of Yeshua of Nazareth (a.k.a. Jesus Christ). The Christian girl wants to observe Eid (a.k.a. Id al-Fitr and 'Id). It a Muslim celebration held on the day after the end of the lunar month of Ramadan. Ramadan recalls the giving of the Muslim holy book, the Qur'an to humanity. It is a time of great rejoicing. Houses are decorated; Muslims buy gifts for relatives. The Peace Tree film has been invited to several film festivals including the Chicago International Children's Film Festival, Fici Film Festival for Children and Young People in Spain, Taiwan International Children's Film Festival, Tribeca Film Festival, Melbourne International Children's Film Festival, and the Mill Valley Film Festival. It was recently invited to the Smithsonian Institute in Washington,. The film has also inspired the creation of Peace Trees in schools around the world. The committees are attempting to organize a special meeting of children at the border between India and Pakistan -- two countries which have experienced a great deal of conflict over the past six decades. 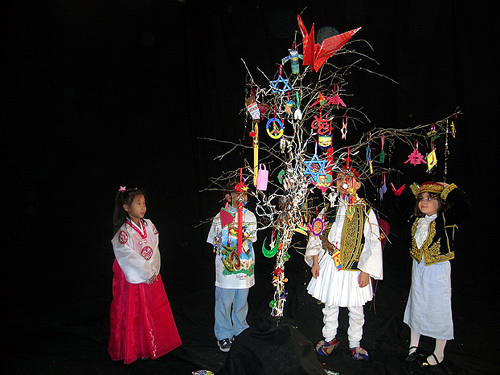 The children will create peace symbols from their cultures and faiths and create a Peace Tree at the border. In future years, they hope to repeat this celebration at the borders of other countries that have been in conflict. They hope that the children involved "will continue their friendship and realize the importance of respect and compassion for each other." The world’s first Peace Tree Day will be launched in Toronto, ON at City Hall on 2006-JUN-01. Nicholas Keung, "A peace tree blossoms in Scarborough," The Toronto Star, 2004-DEC-05, Pages A1 & A17.